Recording Industry Association of America recently published its report on the U.S. music market. The key statistic that stood out was the number of paid music subscriptions in that market which RIAA says came in at 22M by the end of 2016. Looking at SRG’s tracking data on streaming in the last 2 years, we can see where Canadian numbers would come in. As of October 2016, we are estimating about 1.9M subscriptions in the Canadian market, about a ~1 to 12 ratio vs. the U.S. market. Other notes… Canadian penetration rates doubled between September 2015 and October 2016, from 8% to 16%. This is the same pattern as the U.S. market. 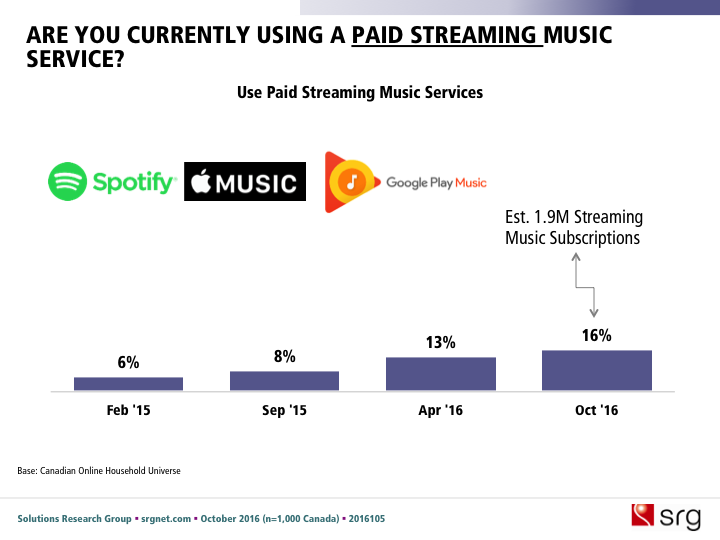 And in the chart you see below, there are three logos on the page; this is because over 80% of those with streaming subscriptions use one of Spotify, Apple Music or Google Play Music. And, Spotify is by far the biggest of the three.